While the Christmas cactus may be known under various names (like Thanksgiving cactus or Easter cactus), the scientific name for Christmas cactus, Schlumbergera bridgessii, remains the same – while other plants may differ. This popular, winter-flowering houseplant makes a great addition to nearly any indoor setting. Christmas cactus is not only easy to care for but propagates easily too, making it an exceptional candidate for holiday gift giving. 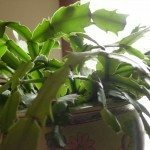 Let’s look at how to how to plant Christmas cactus and care for it.